I saw this Tweet last week and saved it to do a deeper review when I was back home from my hospital stay. In the UK, people often think about inequality in geographical terms. Here's the link that the Twitter post points to. I've been looking for someone mapping poverty and inequality in England, similar to how others have been doing this in the USA. Here's an article I posted in 2011, following riots in London. Since then, I've not found anyone creating maps like those I'm pointing to above. Of course, my goal reaches beyond just creating the poverty maps. I want people to create overlays showing where existing youth tutor/mentor and learning programs are located, and where more are needed. Then, I want to influence the growth of teams of business, non-profit, education and community members who help existing programs grow, and share ideas, that help every program be great. I've written about this in past articles on this blog, and on articles at TutorMentor.Blogspot.com since 2005. I hope you'll take a look. 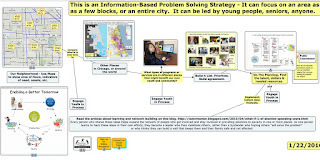 I show the need for planning and action teams, working at the program, neighborhood, city, state and national level. I'd like my ideas to be part of these teams and I'd like to be personally in the conversation, via Twitter, Facebook, LinkedIN, or any other format you choose. If you browse through articles posted on this blog since 2008 you'll see a consistent focus on helping k-12 youth living in high poverty areas. 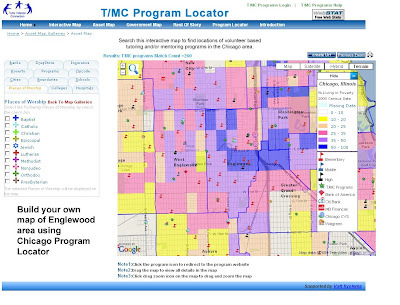 Between 1994 and 2011 the Tutor/Mentor Connection was able to build it's own data maps, including an interactive Chicago Tutor/Mentor Program Locator, to show where non-school youth programs are needed, where existing programs are located, and what assets are available to help programs grow in different places. 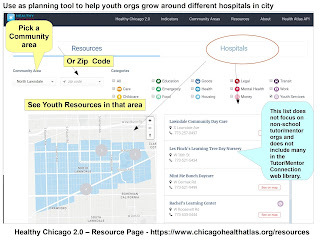 I've not had the money or volunteer talent to update the Program Locator and create map views using ArcGIS software since 2011 , so I point to data platforms hosted by others, which can be used as base-level maps* for stories that intend to mobilize attention and resources to support youth tutor/mentor programs in throughout the Chicago region. One of those is the Community Commons site. 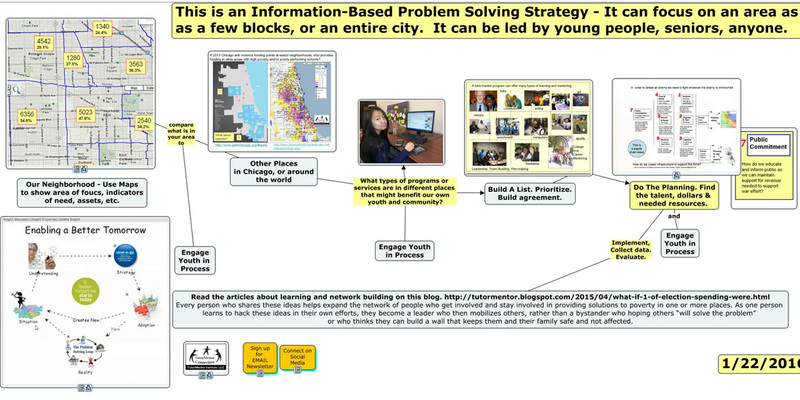 Below is a map view that I created today to show youth in poverty in the Chicago region. Of many features that I like on the Community Commons site is the way they share stories of maps that have been created. And they organize these by channels, or focus areas. This link points to stories related to education issues. The Tutor/Mentor Connection started building a resource library in 1993 and that has continued under Tutor/Mentor Institute, LLC since 2011. Below is a concept map showing various data platforms that can also be used to create map stories. Links to these platforms is just a small part of the Tutor/Mentor web library. Open the map, then open the links under each node to find a direct link to each resource. As you look at them, see if they have a section of stories, similar to the Community Commons site. It would be great if every one of these sites where doing that. Creating data platforms is only a first step in solving problems. Motivating growing numbers of people to visit and use the data, then create stories that draw more attention to places, along with resources to solve problems, is the real work that needs to be done. *What do I mean by "base level maps"? None of the platforms I point to has been building a database of non-school tutor/mentor and learning programs, with sort features for age group served and type of program, they way Tutor/Mentor Connection started doing in 1994. Visit this page and see how the T/MC list of programs can be searched, by these sub-categories. Thus, to support the growth of these programs in Chicago or any other city, someone needs to be doing the on-going research to identify existing programs. 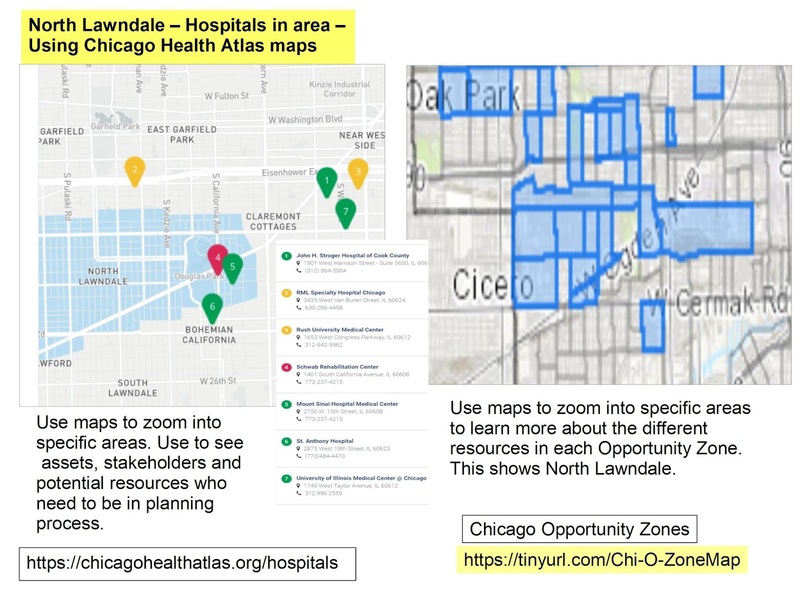 While the Program Locator is not updated, I continue to update the list of Chicago programs and show them on a map, which you can see in this article. Unfortunately, this is not as robust as the original Program Locator. 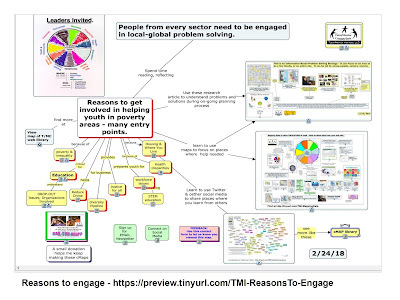 Anyone can be the YOU shown on this graphic, who creates map stories and shares them via social media, blogs, church sermons, newspaper stories, and one-on-one conversations with these goals in mind. Anyone can browse the stories on this blog, and on the Tutor/Mentor Blog and then share those, in your own words, videos and graphics, with people you know. Anyone can help find a partner/investor/university who would help rebuild the Tutor/Mentor Connection and it's mapping capacity, and apply it to cities across the world. I'm on Twitter, LinkedIn and Facebook. If you're one who responds, just connect with me on one of these platforms. Do you like what you read? Visit this page and make a contribution to help me continue to do this work. 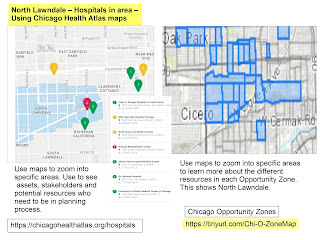 In 2014 I wrote this article about the Chicago Health Atlas. Last night at the weekly ChiHackNight event, the updated version was shown. Below are some screenshots I've created, with links to a couple of articles where I've used these. Here's another screenshot that I just created today, showing the Auburn Gresham neighborhood. I've been creating map stories, using mapping resources that I've had available, and those created by others, for more than 25 years. My goal is to teach others to do the same. Here's one from many years ago. This was created in the 1990s, before I had access to the Internet, and well before I had the ability to create map views with layers of information. However, you can see poverty areas highlighted, indicating a need for youth tutor/mentor programs, among other supports. You can see an Excel list, of programs in the area, based on the Tutor/Mentor Connection survey, and you can see a list of assets (business, faith groups, university, hospital) who could be helping build mentor-rich programs (visualized by the chart). For this map area to be filled with such programs, someone needs to be creating an on-going invitation that reaches out to all the assets on the map, the political leaders, media, and community members, including leaders of existing tutor/mentor programs, to bring them together in an on-going conversation that builds a better understanding of need, and leads to the growth of more, constantly improving youth programs in the area. 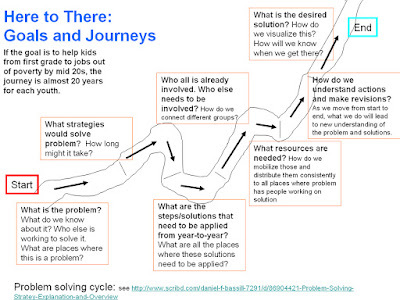 This concept map visualizes that process. 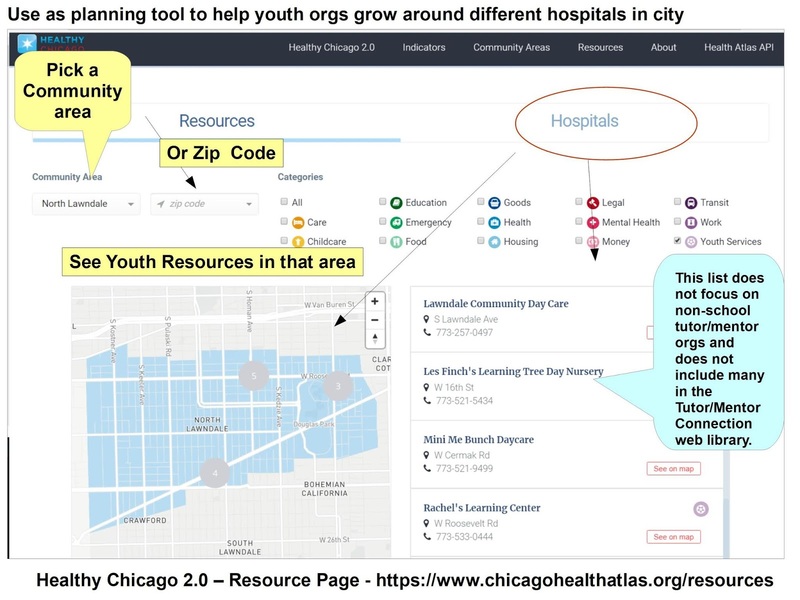 If some, like Chicago Health Atlas, are building and maintaining platforms like this, with a list of resources in each community area, then it will be easier for others to use this list in an invitation process, getting people together on an on-going basis, and innovating solutions that build public will, and a distribution of needed resources, to all parts of the map-area shown. 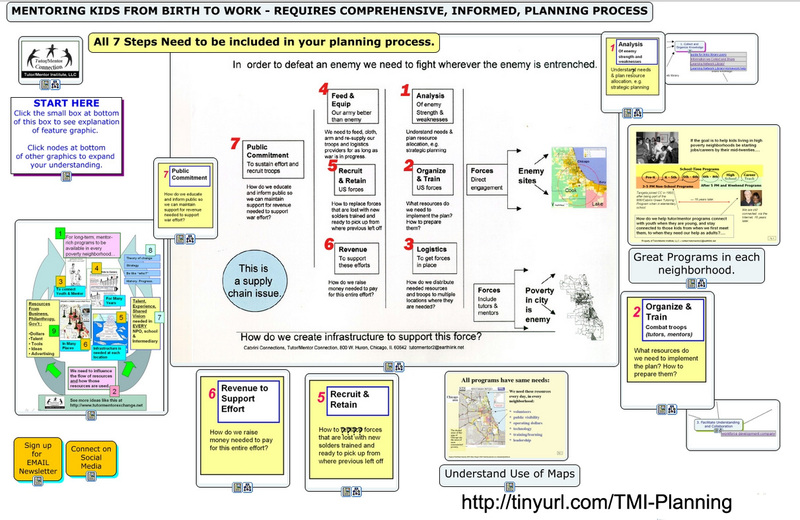 Here's a second concept map, visualizing planning needed. 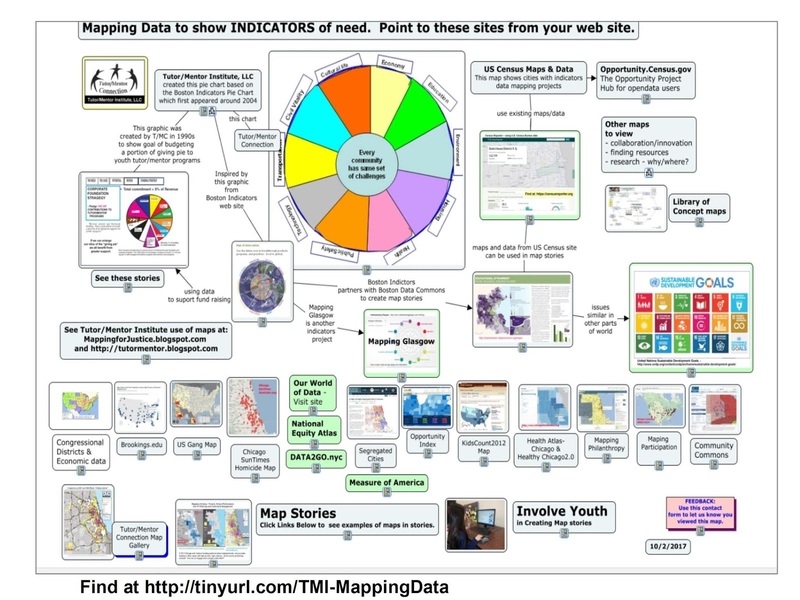 I hope those who are creating data maps will devote space on their web sites to coach others to use their platform for creating map stories that bring people together to solve problems shown by the maps. One group that does that pretty well is the Community Commons site. It's one of many that I point to on this data map. There's a lot of information in my blog articles and on my web site and web library. Use it for on-going learning. Make it a resource for college programs that help grow future leaders. If you appreciate what I'm sharing, I could use your help to pay the bills. Click here to contribute to my FUND TMI page. Within the article is this statement: "The black share of the U.S. population rose only slightly since 1970. From 11.1 percent in 1970 to 12.6 percent in 2010." The map shows a heavy concentration of African Americans in the South East and along the East Coast from New York City South to Florida and in many large cities spread across the country. I'm in Chicago, and started leading a tutor/mentor program serving African American kids living in the Cabrini Green public housing area in 1975. 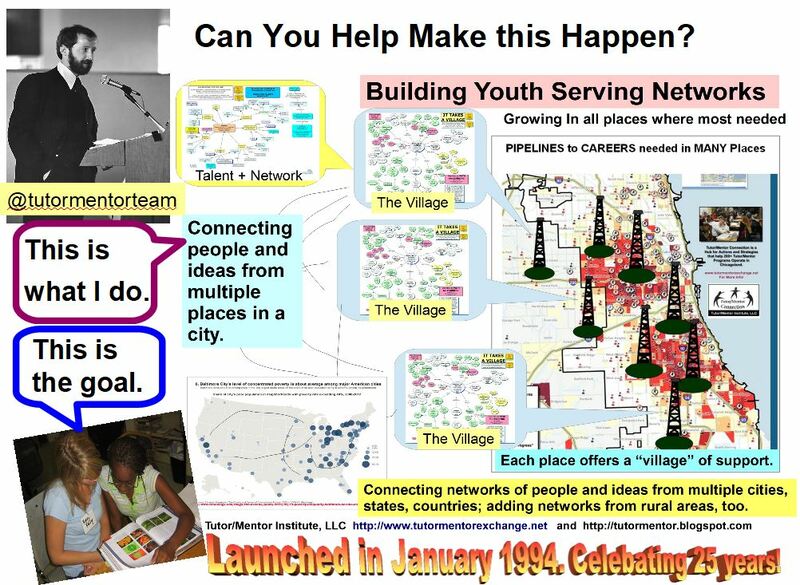 In 1993 I created the Tutor/Mentor Connection (T/MC) to help mentor-rich non-school programs, like the one I was leading, grow in all high poverty areas of Chicago, which were mostly African American and Hispanic neighborhoods. 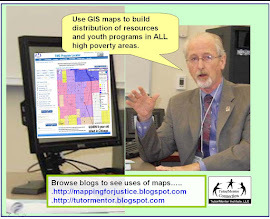 I've been using maps since 1994 to show high poverty areas, in an effort to build public attention and motivate more people to provide time, talent and dollars to help youth tutor/mentor programs grow in all of these areas. 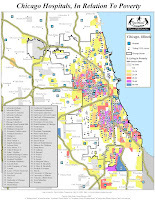 I use tags to help sort the articles in my blog, so if you click the #poverty tag, you can find a series of articles with various maps that show the demographics of Chicago the concentrations of poverty in the USA. Over the past 30 years the population of Black kids in the city has been decreasing. It's still a huge number, but the Hispanic population is almost the same, and many African Americans who lived in the city are now living in the Chicago suburbs, or have moved out of state. 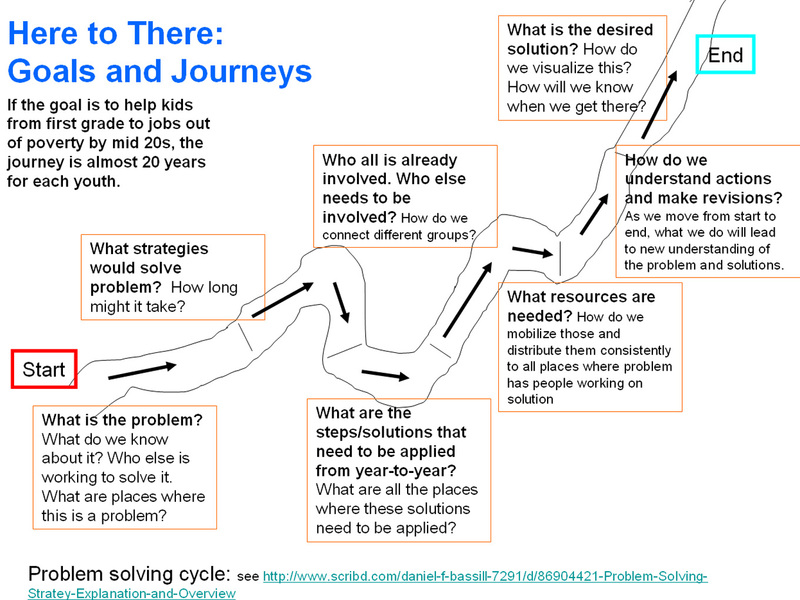 The work I've been doing since early 1990s is building a web library with information anyone can use to better understand issues, know more possible solutions, and then use these ideas in efforts to build and sustain youth tutor/mentor and learning programs that reach more k-12 kids in high poverty areas with support systems that help them move through school and into adult lives free of poverty. 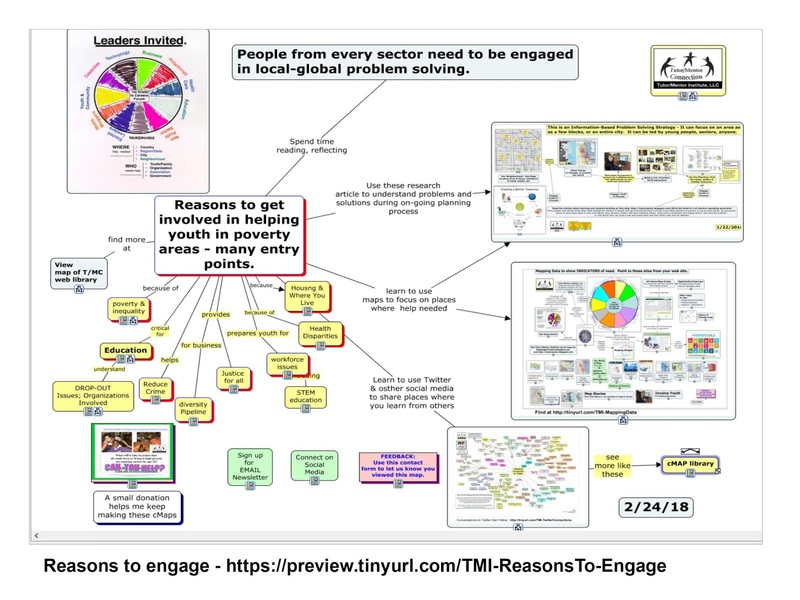 In the concept map below I point to sections of the Tutor/Mentor Connection web library, with links to articles about poverty, race issues, inequality, Black History, etc. In looking at the Brookings article and map I have some questions. a) How do we attract and maintain attention and support for those kids still living in high poverty neighborhoods of Chicago as the population changes? Do solutions need to come from cities rather than from national initiatives? Do solutions need to be regional, focusing on parts of the country with high concentrations of African Americans? Would it be helpful to show similar maps with Hispanic and immigrant populations, showing what percent live in poverty, and where they live? Are there shared experiences that are similar, and that could create political bonds that focus on solutions at the national level? 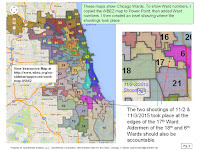 This is a map of the greater Englewood area of Chicago, taken from a Southsideweekly.com article titled Without Representation: How Englewood got mapped into pieces. I drew the line down the middle to show how the Englewood and West Englewood community areas are dividied. I've posted a number of articles featuring Englewood, on the tutor/mentor blog. I encourage you to read the feature article of Sunday's Chicago Tribune, titled Innocence in Peril, which shows the tragic impact of violence and drugs on kids living in the Englewood neighborhood of Chicago. Then I encourage you to use the interactive tutor/mentor program locator to zoom in on the Englewood neighborhood (zip code 60621) and learn about existing volunteer-based tutoring /mentoring programs, or other youth organizations that provide some form of tutoring for kids in these areas. When you look at this, don't think of tutoring or mentoring as a simplistic strategy that cannot overcome the complex, deeply rooted poverty, segregation and racism in Chicago. Think of this as a strategy that connects adults, businesses, faith groups and other resources beyond poverty, in long-term personal connections which transform the volunteers and what they are willing to do to help kids and families. If we don't increase the number of people beyond poverty, who get involved with as much commitment as they would to help their own kids, we'll never have the dollars and political will-power to change the systems of support for kids living in poverty. As you use the interactive map, you can create overlays showing faith groups, businesses, universities in the area who could be helping tutor/mentor programs grow. You can also look at the highways that bring working people from the suburbs, through these neighborhoods every day. 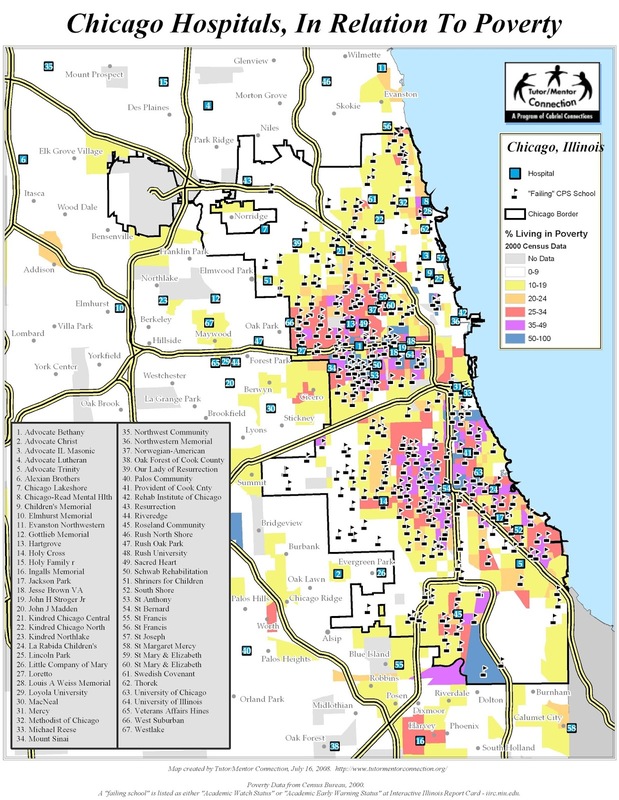 Look at the faith groups on the suburban end of these highways, and think of them as partners who could be educating their members to use this information, and their resources, to help tutor/mentor programs grow in poverty neighborhoods. Visit the Tutor/Mentor Institute to learn more about strategies that readers of this Tribune story might learn so that they are more of the solution, than a drive by reader. 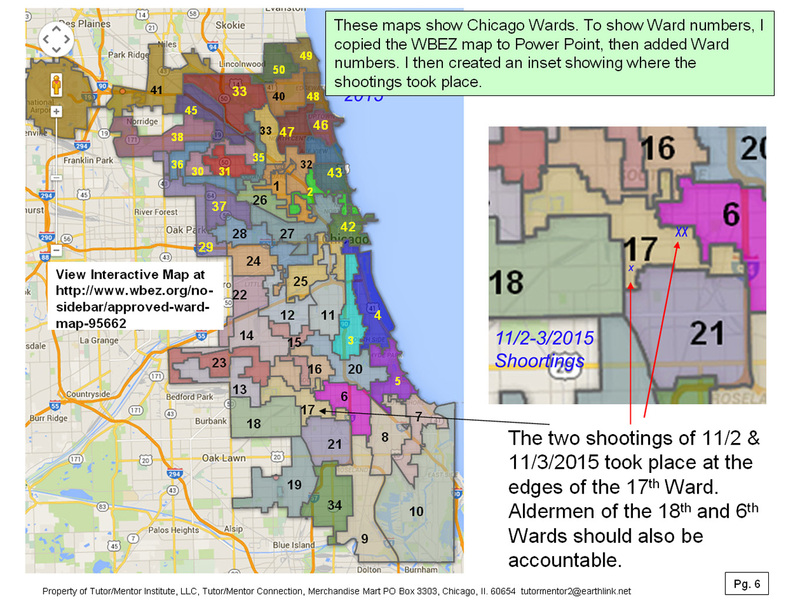 In November 2015 I wrote another article, titled "Using Maps in Long Term Planning" and showed how an area where two shootings took place had multiple layers of political representation. The ChicagoSouthsideweekly.com article shows how this dilutes accountability, and may be contributing to the lack of progress on some of these issues. 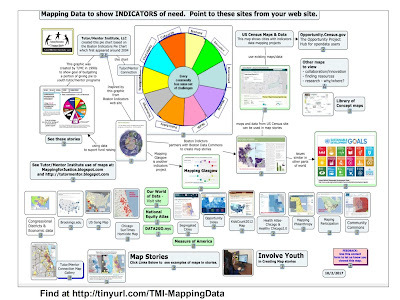 I've been using maps to tell stories and draw resources to high poverty neighborhoods since 1994. Browse through sections of this blog, and the Tutor/Mentor blog, to see many of these. If you value this work, I could use some help, with contributions, to keep on doing it. Click here if interested. The map at the left shows areas of Chicago where people were living in economic hardship in 2014. The red is the areas of high impact, while the darker blue shows areas of medium impact. 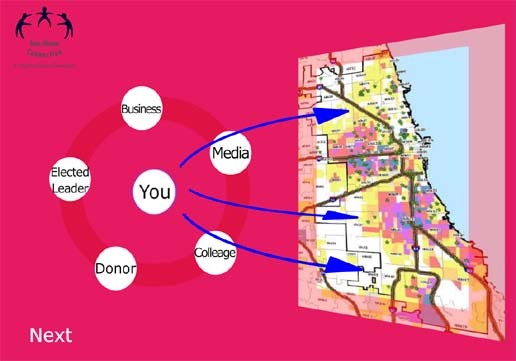 This map is part of an ambitions new plan, titled Resilient Chicago, to create a Chicago "where residents, neighborhoods, institutions, corporations, and government agencies are successfully connected to each other in the pursuit of economic opportunity, safety, equity, and sustainability." I encourage you to take time to go through all sections of the web site and download the full report. 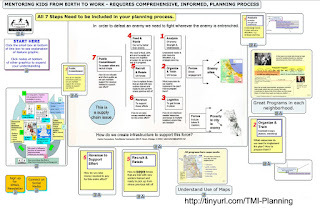 I was not part of the planning process, which started in late 2016, and don't know if any of the ideas on the Tutor/Mentor blog, Tutor/Mentor Institute, LLC site, or this blog, were viewed by any who were part of the planning process. However, I've been sharing maps pointing to these neighborhoods for more than 20 years, focusing on efforts that bring people together to build and sustain mentor-rich non-school programs in each of these areas, as part of a larger strategy of getting more people involved in trying to address the many problems related to poverty, segregation, income inequality, etc. The devil is in the details. How does the city get from "here", the launch of this plan in 2019, to "there", a time in the future when most of the goals of the plan have been met? Follow this link and view some of the articles where I've used the "here to there" concept. Maybe there will be some ideas that leaders can apply to help Chicago make this plan a success. If you are part of this process and would like to bring me and the Tutor/Mentor Connection/Institute, LLC experience into the process, I'd be happy to connect. I'm on Twitter @tutormentorteam. I'm on LinkedIn and Facebook, too.